Gabby, leads New Ravenna Mosaics. 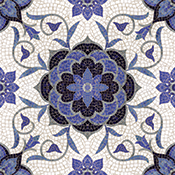 Photo courtesy New Ravenna Mosaics. New Ravenna Mosaics, housed in four repurposed buildings on Virginia’s Eastern Shore, lies thousands of miles west of its namesake — Ravenna in northeastern Italy. Yet artistically the company and the city are closely linked. The United Nations Educational, Science and Cultural Organization’s (UNESCO) World Heritage site of Byzantine mosaics, Ravenna was the inspiration for New Ravenna’s corporate name. The company’s founder, Sara Baldwin, came up with it during her last year in graduate school at the University of Pennsylvania. As a master’s student in fine arts, Baldwin wanted to launch a mosaics business, making commercial use of a fine art — a concept frowned upon by arts purists at the time. She had not visited Ravenna but was well versed in the classical mosaics produced there more than 1,250 years ago. A graduate-school friend, Kevin O’Brien, suggested New Ravenna, and the company was born in Exmore in 1991. In an odd twist on the coals-to-Newcastle theme, Baldwin’s multimillion-dollar mosaics company — which imports most of its rough-cut marble from Italy — is finding a new market for its highly refined, Northampton County-made products in Italy. 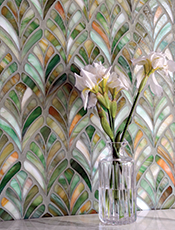 What New Ravenna offers is handcrafted stone and glass mosaic tiles for residential and commercial uses ranging from flooring to decorative borders, murals, field tile and medallions. Nearly 200 national and international designer showrooms sell the custom products to homes, restaurants, hotels, casinos and businesses. Approximately 20 percent of total sales are international. The company’s European distribution is Switzerland-based. In the U.S., the New York area is the company’s largest market, says Baldwin, noting that the entire high-end industry is a small, niche market. “Generally speaking, our domestic customers want the simpler designs, such as flooring with organic texture or pattern. 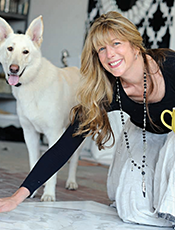 International buyers want more intricate, high-end products, such as entire bathrooms in mosaics,” she says. This year is on track to be New Ravenna’s best year ever, with sales at least 15 percent above those for 2012, according to LaBlanc. The company has 125 employees — at least a half-dozen more than it had before the recent recession. Baldwin sees the “explosion in business due to customers’ desire worldwide to customize.” In August she visited Russian showrooms and returned with her first order. New Ravenna has also done projects for many celebrities — reality TV star Kim Kardashian, recording artist Taylor Swift and filmmaker Stephen Spielberg among them. Somewhere in almost every pattern is the hint of a wave or a sandy beach, which reflects the Eastern Shore environment in which Baldwin has spent her life, growing up on the McCaleb farm near Craddockville. Living with her two children in a contemporary home on a bluff overlooking the Shore’s bayside, she has trained design teams (one includes her sister, Ellen McCaleb) in creating patterns to be grouted together and applied to walls and backsplashes. The company’s principals and directors have chaired and served as board members of the Boys and Girls Club of the Eastern Shore and lead its primary annual fundraiser. They’ve also served on local chambers of commerce boards, donated to dozens of charities’ silent auctions each year and been near or at 100 percent employee participation in United Way’s automatic payroll deduction campaign. Baldwin flies to Bologna — known for its delicious cuisine and medieval architecture — for Europe’s largest tile show every September. After that event, she travels to Verona — the spiritual home of Romeo and Juliet — for the marble fair, Marmomacc. Hearkening back to her company’s namesake, she also travels to Ravenna. With a heritage in industry and agriculture, Northampton County also has a southern tip with a globally significant wildlife habitat. Tourism —including easy access to Chesapeake Bay and Atlantic Ocean fishing — is important to the economy. Bay Creek in Cape Charles offers the Arnold Palmer and Jack Nicklaus golf courses. When New Ravenna brings in dealers from Canada and overseas, the historic, waterfront town of Cape Charles is the nexus of entertainment. Many guests stay at the Cape Charles Hotel; boat trips to barrier islands and kayaking trips to Chatham Vineyards are among the activities enjoyed.